How to unlock washer door? Is it possible to unlock my front load washer door when locked or during mid cycle? At the start of a wash cycle, I sometimes forget to add all my clothing or garments. How can I add any clothes to my washer once I have started the wash cycle? Basically how do I override the washer door AFTER it is locked and wash cycle has started? If you happen to forget to add clothing or need to remove clothing once you start the washer, most front load washers will let you add clothing within the 1 TO 5 MINUTE MARK of starting the wash cycle. Within 5 minutes of pressing the START button, simply press the START/PAUSE button to pause the washer and allow you to open the washing machine door and add more clothing. However once water has reached a certain level in the washer tub, you cannot open the washer door until end of cycle. After 5 minutes a front load washer door is not able to be opened during a wash cycle when full of water. This is because the water will spill out because the tub and door is positioned horizontally. 1. Within at least 5 minutes of pressing the START/WASH button, press the START/PAUSE button to unlock the washer door. 2. Now open the washing machine door once unlocked and add or remove any extra clothing. 3. After adding or removing clothing, close the washing machine door until it clicks into place. 4. Once the washing machine door is closed press the START/PAUSE button to resume the wash cycle. 5. To change a wash cycle at this point, simply press the START/PAUSE button and change to a different wash cycle. After 5 minutes a front load washer needs to drain out the water completely before the door can be opened. The washer door is locked because the tub is filled with water. These washer unlock methods will work for front-load washing machines made by Samsung, LG, Whirlpool and more. However not all washer models are the same, and some models do not offer DIY solutions. This may force you to find a professional technician. 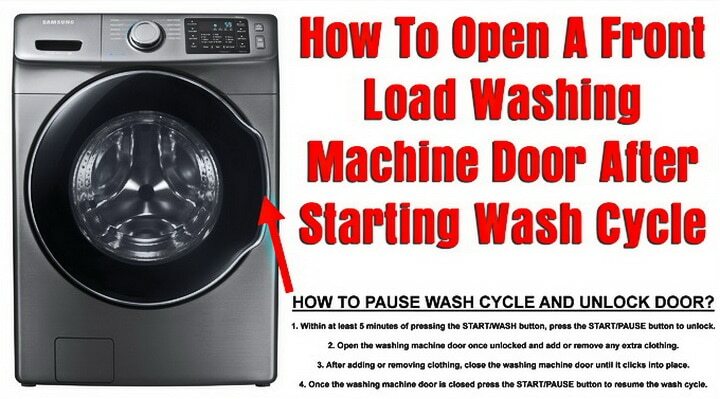 Need help with opening your front load washer door after the wash cycle starts? Please leave your question below and include the model number of your washer.